When the Heilman Center pain specialists order an MRI scan for back pain, it’s a chance to pinpoint the root cause of your pain. It’s also a chance for us to design a personalized treatment plan. When do doctors and pain specialists choose MRI vs. X-ray for back pain? Let’s take a look at how the technology works, what it helps doctors to see, and what you can expect the day of your MRI. If it makes you feel more comfortable, you can wear your own clothes, provided they are metal-free, or you can wear one of our gowns. Before doctors had the ability to take images of the structures inside your body, they had to make an educated guess as to what caused patients to have back pain. X-rays enabled doctors to see bones and dense structures, like tumors, but they couldn’t see soft tissues because the X-ray radiation passed through them. Tools like CT scans could picture internal structures in greater detail, but because CT scans utilize X-rays, they exposed the body to radiation. Magnetic resonance imaging, or MRI, gives doctors tools to see soft tissues and other body structures in greater detail without the use of radiation. Your doctor can see your spinal vertebrae with an X-ray; with an MRI, they see disc tissue in detail. Thanks to the high-resolution images provided by MRI, we have a noninvasive way of seeing what is happening when our patients experience pain. Not every pain experience requires patients to get an MRI. Sometimes, a pain specialist can provide effective treatment without requiring a scan, depending on your current health and the severity of your symptoms. When pain is ongoing or severe, or when it’s accompanied by other concerning symptoms, we may recommend an MRI to learn more about what’s going on beneath the surface. When you get an MRI for lower back pain, sciatica, or another pain condition, you lie inside an open-ended tube surrounded by magnets. The noninvasive imaging technique uses a combination of magnets and radio waves to create cross-sectional, 3-D images of the interior of your body. Creating the images requires you to lie as still as possible within the tube. You may be inside for as few as 15 minutes or as long as an hour, depending on what your doctors need to investigate. As you’re getting your MRI, you may hear loud thumping or clicking sounds from the magnets. If these noises annoy you, ask for earplugs when you arrive so that you can relax during the procedure. If you suffer from claustrophobia and fear being inside the tube, don’t worry — your doctor can help. Ask about the possibility of taking something that can help you relax. 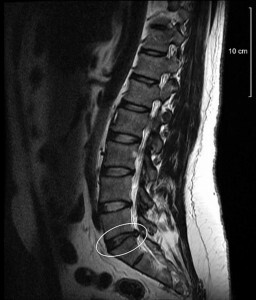 This image, specifically, shows doctors the exact location of a herniated disc and what it currently looks like, so they can decide how to treat it. MRIs are currently performed on-site at our Michigan office, to provide everyone easy access to MRI scans for back pain at our facility. Even non-Heilman Center patients can book MRIs at either location, with an order form from their physician for the MRI. Our team will help you understand if your insurance will cover the scan or not. 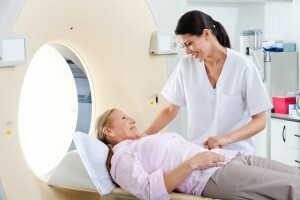 You can usually schedule and attend your MRI within a week. We don’t want you to have to wait for the crucial information an MRI provides by scheduling separate appointments at a future date or driving to an off-site location. If you have back pain, neck pain, sciatica, or any other ongoing or severe pain, don’t wait for it to get worse. Don’t be kept from work, from spending time with family and friends, or from enjoying the activities that you love any longer. Contact the Heilman Center to learn more about on-site MRI scans and schedule a consultation with a pain specialist. Get on the road to feeling better. Call 888-683-0716.